UITS Monitor: Too many tech questions? Feel trapped in the Upside Down? 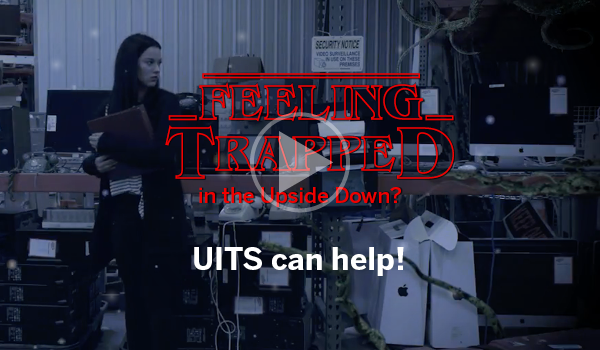 UITS can help! Why are you getting this newsletter? All the latest news on IT resources, delivered right to your inbox. The UITS Monitor is IU’s official correspondence to notify faculty, staff, and students on all IU campuses about available IT resources. Every other week, it will arrive in your inbox full of information about IT services and support available to you, as well as other notable IU news. Walk-in hours and 24/7 support are available on every campus. Tech problems are bound to happen, and probably at the time that's least convenient to you. Luckily, the UITS Support Center provides IT support to all IU campuses, at all hours. Help is just a phone call away on every campus—other support options could include email, walk-in hours, and live chat, depending on the campus. For the most efficient assistance, be ready to provide details about your problem or question. Get the skills you need to succeed with UITS IT Training. With UITS IT Training, students, faculty, and staff can make the most of IT services and applications through a variety of learning options, including online and in-person training. Learning partners and training providers both inside and outside of IU work with UITS IT Training to ensure you have access to the resources you need. UITS Research Technologies' series takes the fear out of high performance computing. Nominate your favorite IT all-star! Know an IT employee who goes above and beyond, solves your tech issues, and is an all-around great person? The IT Leadership Community (ITLC) wants to know, and better yet, wants to give that person a Technologist Recognition award! You need tech skills, and technology needs you. The mission of IU's Center of Excellence for Women in Technology (CEWiT) is to "inspire, encourage, and educate IU women in every major to develop and use tech skills to empower and enhance career success." CEWiT wants to connect and inspire a community of tech-savvy women. If you'd like to be one of those women, contact cewit@indiana.edu or add yourself to the CEWiT mailing list.